The Environment and Natural Resources Program's mandate is to conduct policy-relevant research at the regional, national, international, and global level, and through its outreach initiatives to make its products available to decision-makers, scholars, and interested citizens. Over the past 30 years environmental policy has changed dramatically. Today it is an integral part of energy policy, economic development, and security. Security means not only protection from military aggression, but also maintenance of adequate supplies of food and water, and the protection of public health. These problems cannot be addressed from one discipline or from the perspective of one issue or one country. The world of the future will demand the integration of multiple needs and values across both disciplinary and geographic boundaries. While our projects and activities continue to evolve, our perspective remains global and interdisciplinary, linking the fields of science and policy. ENRP looks forward to being an active participant in the environmental policy debate as it evolves over the course of this decade. Announcement: The 2018 Roy Family Award for Environmental Partnership has been awarded to the Advancing Green Infrastructure Program in New Haven, CT. For more information, see the full press release. The Roy Family Award for Environmental Partnership is presented every two years to an outstanding cross-sector partnership that enhances environmental quality through novel and creative approaches. have taken risks that result in significant changes that benefit the environment and create leverage for greater action. organizations must work together collaboratively on a project or program that tangibly improves the quality of our environment. Each year, 257 million gallons of combined sewage flow into surface waterways surrounding New Haven during rain events, exceeding the capacity of the combined sewer system, negatively impacting ecosystem health and quality of life. The contamination and street flooding are the direct result of stormwater runoff from the City’s increasing impervious surface cover, which overload both the combined and storm sewer systems. Constructing added capacity and separating the combined system is an ongoing, expensive, and disruptive process. The Advancing Green Infrastructure partners worked together to develop, pilot, and implement a program that is demonstrating the effectiveness of bioswales to reduce pollution from runoff and prevent street flooding. The Dow-TNC Collaboration is an innovative partnership between The Dow Chemical Company and The Nature Conservancy to research the value of ecosystem services. Established in 2011, the five-year project combines the expertise of Dow, one of the world’s largest chemical manufacturers, and TNC, the foremost global land and water conservation organization, to develop tools and models that incorporate the value of resources provided by nature into business decisions. Ecosystems provide valuable services for communities and companies. Measuring the value of water, land, air, oceans, plants, and animals to a company or community is difficult, and as a result, business decisions are often made without taking natural assets into account. The Dow-TNC collaboration takes a science-based, measurable approach to help companies understand how to incorporate the value of nature into the business decision process. The ecosystem services framework has long been hailed by academics as a viable mechanism for valuing nature, but has not been practically applied – until now. 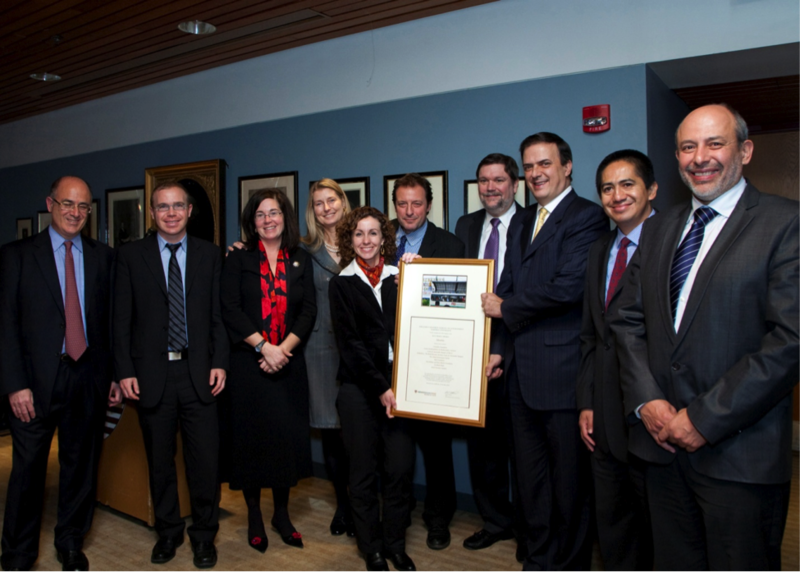 In January 2011, Dow and TNC launched their 5-year collaboration to promote valuing ecosystem services in business decision-making. Since the launch, Dow and TNC have worked together to identify key ecosystem services that Dow relies upon as well as the environmental impacts of priority Dow manufacturing sites around the world. Scientists from TNC and Dow are working together at selected Dow pilot sites to implement and refine models that support corporate decision-making by taking into consideration the value and resources that ecosystem services provide. These sites serve as “living laboratories” where Dow and TNC are testing methods and models of ecosystem valuation so they can be used to inform more sustainable business decisions at Dow and influence the decision-making and business practices of other companies globally. The collaboration recently completed its first pilot at Dow’s facility in Freeport, Texas, the company’s largest manufacturing facility; and is currently in the midst of the second pilot in Santa Vitoria, Brazil. A major goal of this collaboration is to produce results and findings that are replicable and transferable to Dow’s other 135 sites. In addition, most of the methodologies, tools and results will be shared publicly with the hope that other companies, non-governmental organizations and governments can make use of them as well. “Valuing natural services is a critical step in protecting our environment – and one that should be replicated around the globe,” said Henry Lee, director of the Environment and Natural Resources program at Harvard Kennedy School’s Belfer Center for Science and International Affairs, in announcing the 2013 award winner. In 2011, ENRP awarded the Roy Family Award to Refrigerants, Naturally!, a unique global initiative of companies committed to combating climate change and ozone layer depletion by substituting harmful fluorinated gases ("F-gases", such as CFCs, HCFCs and HFCs) with natural refrigerants. Since Refrigerants, Naturally! 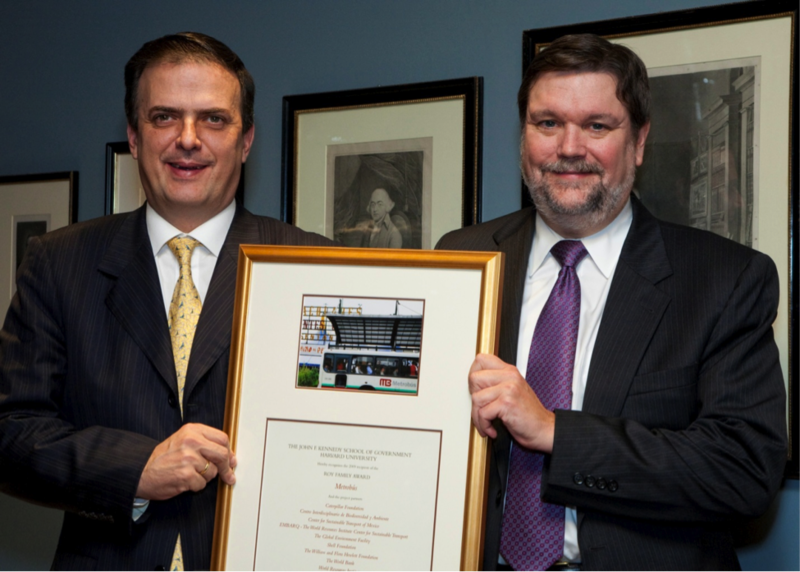 received the Roy Family Award for Environmental Partnership in 2011, the partners have continued their efforts to provide HFC-free cooling equipment in Europe, the US, and around the world. Unilever, for example, has rolled out more than one million HFC-free ice cream cabinets. Coca Cola remains committed to their goal of going HFC-free in all new equipment by 2015 and at the London Olympics already every single one of Coca Cola’s 3,130 vending and cooling units are HFC-free, most of them using CO2 technology. In February 2012, the US Environmental Protection Agency finally included hydrocarbon refrigerants such as propane and isobutane in their list of substitutes for ozone-depleting substances in household refrigerators and freezers – a decision Refrigerants, Naturally! had long been hoping and advocating for. Hydrocarbon refrigerants have zero ozone depletion potential (ODP) and very low global warming potential (GWP) compared to other refrigerants. Partner companies are Unilever, McDonald’s, The Coca Cola Company, Pepsico, and Red Bull, which joined in 2011. UNEP and Greenpeace are supporting partners. Several companies have expressed interest in committing to an HFC-free future and participating in the partnership. The members are optimistic that their number will continue to grow. In 2009, the Roy Family Award was given to the Mexico City Metrobus, a Bus Rapid Transit (BRT) system that reduces air pollution and greenhouse gas emissions, while improving the quality of life and transportation options in one of the largest cities in the world. The Metrobus system is a result of a partnership launched by EMBARQ - The World Resources Institute Center for Sustainable Transport - with assistance from CEIBA (a Mexican NGO) and the Mexico City government and with funding and support from the Shell Foundation, Caterpillar Foundation, Hewlett Foundation, and the World Bank. Through this collaboration, EMBARQ, CEIBA and Mexico City established the Center for Sustainable Transport in Mexico, now known as EMBARQ Mexico, the not-for-profit organization that has provided ongoing technical assistance to the Metrobus system from its inception through its expansion. The Metrobus system has expanded rapidly in recent years, from 20 kilometers in 2005 to 95 kilometers in 2012. In April 2012, the system expanded even further: it opened Line 4, which runs through the historic downtown neighborhood of the city and extends to the airport. As of 2012, the Metrobus system served 760,000 passengers per day. 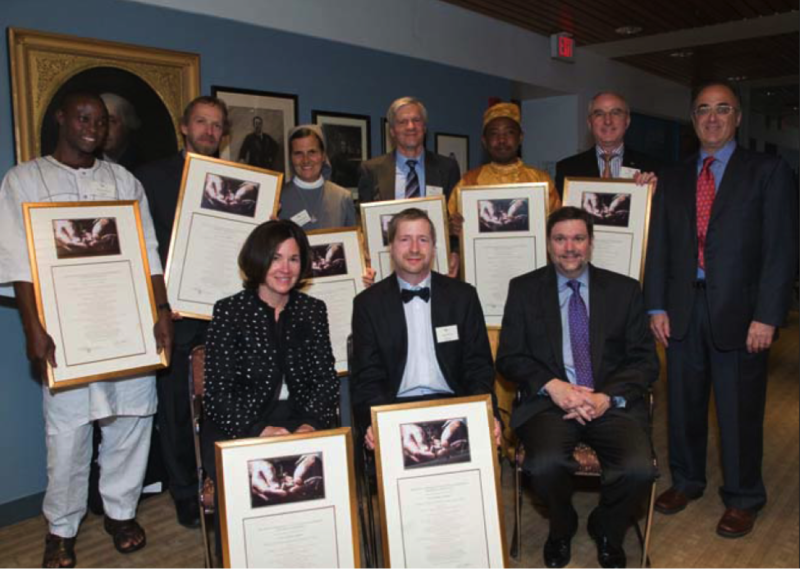 In 2007, ENRP awarded the Roy Family Award to the Hybrid Systems for Rural Electrification in Africa (HSREA), a collaboration among Energiebau Solarstromsysteme, a German solartechnology provider; InWEnt- Capacity Building International, Germany, a non-profit organization with expertise in human resources development, and their African colleagues at Kakute Limited, a technology training company in Tanzania; RENERG Ghana; and the Vincentian Sisters in Mbinga, Tanzania. The HSREA Project provides reliable, renewable electricity to rural African villages through a system of solar panel technology combined with modified diesel motors running on pure plant oil from the plentiful jatropha nut. After being awarded with the Roy Family Award 2007, the project team composed of InWEnt – Capacity Building International, Germany (now: GIZ - Gesellschaft für Internationale Zusammenarbeit GmbH) and Energiebau Solarstromsysteme, Cologne/Germany together with its main partner Kakute Ltd. Arusha/Tanzania intensified the capacity building activities in Ghana, Mali, and Tanzania. It implemented training courses in Ghana, Mali, and Tanzania to enhance the local capacities for optimized jatropha cultivation. As part of the regional outreach, a special training in Tanzania was also offered for experts from Ethiopia. Besides this, two motor trainings for multi-fuel generators were carried out in Cologne/Germany to ensure proper operation of the installed hybrid-systems. In order to underpin the relevance of jatropha in general and specially of hybrid-systems combining photovoltaic systems with refitted generators running on straight vegetable oil from the jatropha nuts, a regional “Dialogue Forum on Biofuels for Poverty Alleviation” was carried out in December 2008 in cooperation with UNEP-DTIE and FAO, bringing together representatives from the relevant ministries for rural and social development, research institutes and NGOs from Cameroon, Ethiopia, Ghana, Kenya, Mali, Mozambique, Ruanda, Tanzania, Uganda, and Zimbabwe. The reason for focusing poverty alleviation on the political level was that more and more African countries were confronted with an international hype caused by the search for alternatives to fossil fuels. They experienced increasing pressure to convert arable land into plantations for export-oriented production of oil seeds – among others jatropha – without having defined their own biofuel policies. The forum therefore came up with recommendations on how to shape such policies. Under such circumstances, the approach to use straight vegetable jatropha oil for fueling off-grid power systems in rural areas is still innovative but has also to compete with diesel generators that are cheaper in the short run than hybrid-systems, but are inefficient and extend the dependence on fossil fuels. A promising program is now developed in Zimbabwe using the HSREA approach and its network: The NGO Environment Africa is engaged in a project working on three pillars: policy development, research and, community development. The aim of the last is to assist community groups in setting up small businesses on processing of the seed for production of oil for soap making and energy. This also involves setting up a hybrid system. Two oil milling plants in Mudzi and Mutoko districts have been developed yet. The installation of the hybrid-system is scheduled for next year. 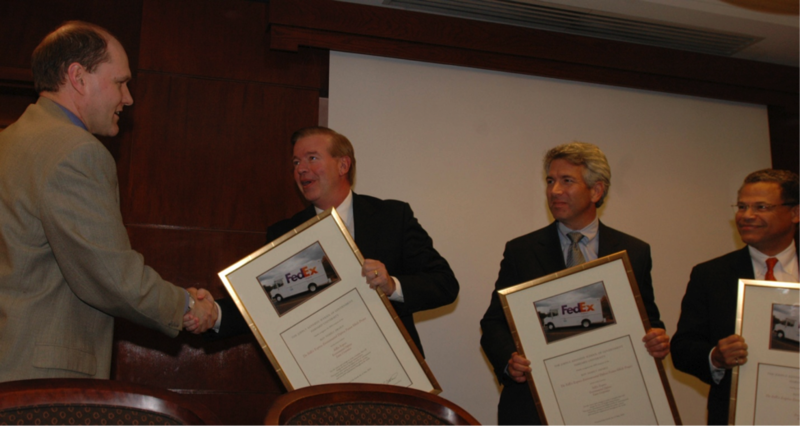 In 2005, ENRP awarded the Roy Family Award to the FedEx-Environmental Defense Future Vehicle Project, in which FedEx committed to make the hybrid truck its standard replacement vehicle for its fleet of 30,000 medium duty delivery trucks if emissions, performance, and cost goals were met. 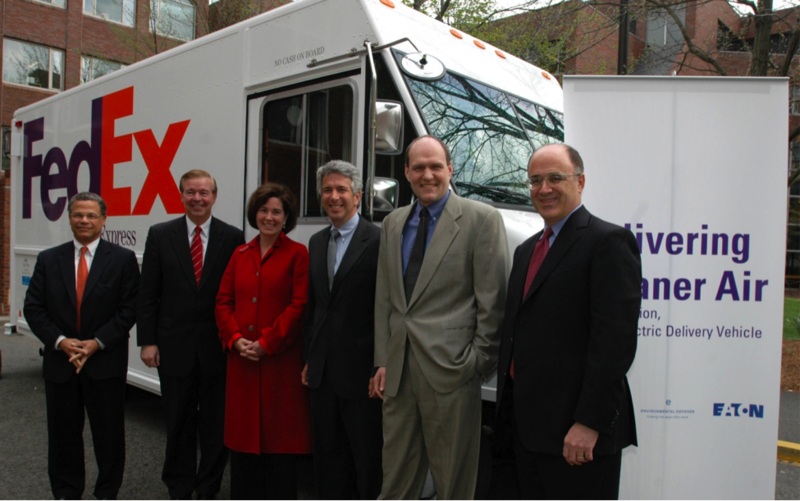 While the economics of the hybrid truck and more viable alternative options such as smaller trucks meant that FedEx did not replace all of its trucks with hybrids, as of 2012 it had 330 hybrid-electric delivery vehicles and a total of 1,869 alternative-fuel vehicles in its fleet. The project was a catalyst for bringing hybrids to the truck marketplace. Located in the northeast of Bolivia, the Noel Kempff Climate Action Project (NK-CAP) preserves the rich and biologically diverse ecosystems of Noel Kempff Mercado National Park. The Noel Kempff Mercado National Park is located in one of the few areas in South America where several different ecosystems converge: the evergreen forest of the highlands, the cerrado’s savannas, the savanna’s wetlands, and the forest’s wetlands. In 1997, when 832,000 hectares of tropical forest adjacent to the park were threatened with timber harvesting and deforestation, The Nature Conservancy (TNC) and Bolivian conservation organization Fundación Amigos de la Naturaleza (FAN) created the NK-CAP. Together with the Bolivian government and three energy companies, the partners terminated the logging rights and the land was incorporated into the national park. Then the project partners launched a rigorous scientific program to measure the carbon stored in the project area and the carbon emissions avoided by the project. It considerably expanded biodiversity protection in Bolivia. It preserved a rich and biologically diverse forest ecosystem. It was included in the UNESCO’s list of World Heritage Sites. It avoided 1,034,107 tons CO2 emissions, which would have been caused by logging and deforestation between 1997 and 2005. It guaranteed the long-term projection of Noel Kempff Mercado National Park. It contributed substantially to the empowerment of the indigenous communities in Bajo Paraguá and to community development, in particular. It supported indigenous communities to achieve legal status as "Communities of Native Peoples" and to apply for official recognition of their land title. It provided alternative, environmentally sustainable economic opportunities for the local population. In November 2005, an internationally accredited certifier evaluated and certified the Noel Kempff Climate Action Project design and its emissions reductions. It was the first forest emissions reductions project to be fully certified using rigorous standards based on those used in the Clean Development Mechanism. The Noel Kempff project provided an excellent working example of how carbon sequestered in the living biomass of forests, and emissions reductions achieved through forest conservation, can be scientifically quantified, monitored and certified, and also generate benefits for biodiversity and local communities. Due to the current position of the Plurinational State of Bolivia, which is opposed to carbon markets, the project is analyzing opportunities and scenarios to adjust to the Bolivian policies regarding the climate change regime, and to continue generating benefits to biodiversity conservation and local communities in the Noel Kempff Mercado National Park. ENRP offers several funding opportunities for Harvard Kennedy School (HKS) and Harvard College students. Incoming HKS students can apply for the Roy Family Fellowship, a two-year scholarship for MPP or MPA students. Harvard and HKS Ph.D. candidates can apply for a year of support through the Joseph Crump Fellowship. Returning HKS and Harvard College students are eligible for funding through the Roy Family Summer Environmental Internship program. This fellowship is open to all two-year degree program candidates in the Master in Public Policy, Master in Public Administration, and Master in Public Administration/International Development programs. It provides full tuition for two years through the generous support of the Roy Family Student Support Fund. This fellowship is not open to joint or concurrent degree candidates. To be eligible, applicants must have demonstrated an interest in environmental and energy issues, either through public or private sector work experience or through related entrepreneurial experience as an undergraduate. Successful applicants will also make a strong case that they intend to focus their studies at the HKS on environment or energy issues. Preference will be given to candidates with a demonstrated interest in public-private partnerships and market-oriented solutions to realize environmental or energy goals. The Roy Family Fellow will consult with Environment and Natural Resources Program faculty to assure that his or her curriculum choices will advance his or her understanding of and ability to contribute to environmental policy. Fellows will be selected based on outstanding merit, from applicants who meet all relevant admissions criteria for the Harvard Kennedy School. Both domestic and international students are eligible to apply. Two-year HKS degree program students will receive funding for both academic years, so long as the recipients remain in good academic standing and enroll in a program of courses relevant to environment and energy issues. ENRP offers the annual Joseph Crump Fellowship in conjunction with the Center for Business and Government to support a Harvard PhD candidate conducting research on the environment, natural resource management, or the intersection between energy and the environment. Preference is given to Kennedy School students. The Joseph Crump fellow is expected to be involved with one or more ongoing research projects within the sponsoring centers and to write at least one publishable paper in the area of energy, environment, or natural resource policy. Former Crump fellows completed work on topics such as "Technological Diffusion in China's Iron and Steel Industry" (Karen Fisher-Vanden '98); "Institutional Change in the Electricity Industry: A Comparison of Four Latin American Cases" (Carlos Ruffin, '00); and "Thirsty Colonias: Determinants of Water Service Coverage in South Texas" (Sheila Cavanagh, '02). For information, visit the Crump Fellowship website. The Vicki Norberg-Bohm Fellowship, made by the Science Technology and Public Policy Program and the Environment and Natural Resources Program at Harvard’s Kennedy School of Government, supports Kennedy School of Government PhD candidates conducting early exploratory research on energy or environmental issues. The fellowship is designed to enable doctoral students to expose themselves to a wide range of researchers and research approaches early in their training before they make their ultimate choice of a dissertation topic. The $7,000 award can be used for a variety of activities such as conducting field work, providing support for an internship, or learning a foreign language in a host country. The award is a tribute to the late Dr. Vicki Norberg-Bohm whose work focused on understanding the process of technological change and the role of public policy for stimulating innovation and diffusion of environment-enhancing technologies. For information, visit the SSP website. ENRP offers funding for innovative summer projects that ordinarily would not offer a salary. The Roy Family Summer Environmental Internship allows returning students to craft their own internship for a public, private, or non-profit organization abroad or in the United States. Award recipients will be chosen based on the merit of their projects. To craft the most valuable, well-developed project proposal, you must begin work now, contacting potential sponsors and developing your idea. The application deadline is March 27, 2019 (see details below). Each Roy Family Summer Internship provides up to $7,000 for the summer. Any Harvard Kennedy School student who has completed two semesters of course work and is returning to HKS for the coming fall semester. (You must be a returning student to apply. Not open to May 2019 graduates). What type of work will be supported? The work must focus on a topic that relates to energy, environment, or natural resources, and it must be conducted under the direct auspices of a public, private or non-profit organization anywhere in the world. The work can involve research or implementing or managing programs or projects. The work does not have to be with an environmental or energy organization per se, nor does it have to focus exclusively on environment or energy topics. For example, a project with a local planning board that involves working on topics that have an environmental component would be eligible. Candidates must negotiate their project or responsibilities with an eligible organization, which must agree in writing to employ the candidate for a minimum of ten weeks between the end of the spring semester and the beginning of the fall semester. The work conducted under this internship should be of direct benefit to the selected organization and the work should further the student's education. It is the student's responsibility to identify their potential employers and negotiate the arrangement. What are the employing organization's responsibilities? The organization must agree to provide the student with supervision and direction. The organization must provide workspace and office resources and, if relevant, travel expenses other than the initial travel to and from the project site. When must the internship take place? The student must work a minimum of ten weeks between the end of the spring semester and the beginning of the fall semester. How the student schedules the time is up to the student and the employer. A description of the organization and the proposed project. A one-page letter summarizing why this opportunity will benefit both you and the organization. A letter from the employing organization agreeing to the arrangement and the responsibilities outlined above. A recommendation letter from an HKS faculty member. 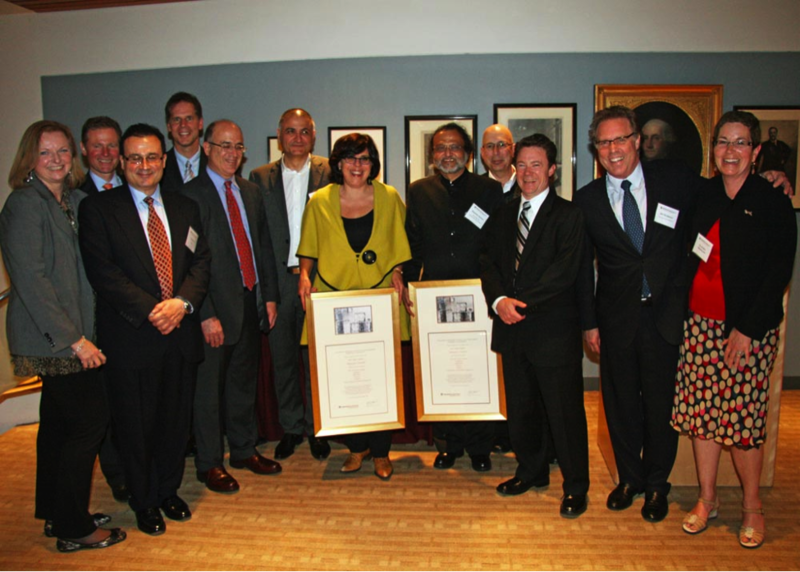 A committee of HKS faculty and environmental leaders will review the applications and determine the awards. The committee will weigh the merits of the proposed project, the qualifications of the applicant, and the employing organization's ability to pay. Some preference will be given to internship offers from organizations that would be otherwise unable to pay for a masters-level intern. ENRP offers funding for innovative summer internships that ordinarily would not offer a salary. The Roy Family Summer Environmental Internships allows returning Harvard College students to craft their own internship for a public, private, or non-profit organization abroad or in the United States. Each Roy Family Summer Internship provides $4,000 salary for the summer, and up to $1,300 travel funds for transportation to and from a project country. The work must focus on a topic that relates to energy, environment, or natural resources, and it must be conducted under the direct auspices of a public, private or non-profit organization anywhere in the world. The work can involve research, or implementing or managing programs or projects. The work does not have to be with an environmental or energy organization per se, nor does it have to focus exclusively on environment or energy topics. For example, a project with a local planning board that involves working on topics that have an environmental component would be eligible. Candidates must negotiate their project or responsibilities with an eligible organization, which must agree in writing to employ the candidate for a minimum of ten weeks between the end of the spring semester and the beginning of the fall semester. The work conducted under this internship should be of direct benefit to the selected organization and the work should further the student's education. It is the student's responsibility to identify their potential employers and negotiate the arrangement. The organization must agree to provide the student with supervision and direction. The organization must provide workspace and office resources, and, if relevant, travel expenses other than the initial travel to and from the project site. A short description of the organization and the proposed project. A recommendation letter from a member of Harvard University. A committee of faculty and staff will review the applications and select the recipients. The committee will weigh the merits of the proposed project, the qualifications of the applicant, and the employing organization's ability to pay. Preference will be given to internship offers from organizations that would be otherwise unable to pay an intern. Applications must be emailed to ENRP@hks.harvard.edu and received by March 27, 2019. © Landsat/Copernicus. Used with Permission. The Environment and Natural Resources Program is participating in the international research project Effectiveness of Partnerships for Advancing the Sustainable Development Goals: Behavioural Pathways and Impacts. This project, coordinated by the Graduate Institute of International and Development Studies, will contribute to scientific and practical progress by providing the first inter-disciplinary, integrated, and comparative theoretical approach and data on the effectiveness of partnerships for sustainability. ENRP’s contribution to this project is directly linked to a pioneer database about environmental public-private partnerships, in the framework of the Roy Family Award for Environmental Partnership. The Roy Award is presented every two years to celebrate outstanding public-private partnership projects that enhance environmental quality through novel and creative approaches. Since 2003, the Roy Award has recognized eight winning partnerships and has engaged with many more finalists and nominees during our rigorous evaluation process. The Roy Award nominations are evaluated with the following criteria: Innovation, Effectiveness, Transferability, and Significance. Effectiveness is measured by determining if and how the project has made demonstrable, concrete progress towards achieving its goals, and how the goals contribute to solving an environmental problem. The partnership is evaluated on its actual results achieved to date and the potential results if the project’s approach is widely adopted. 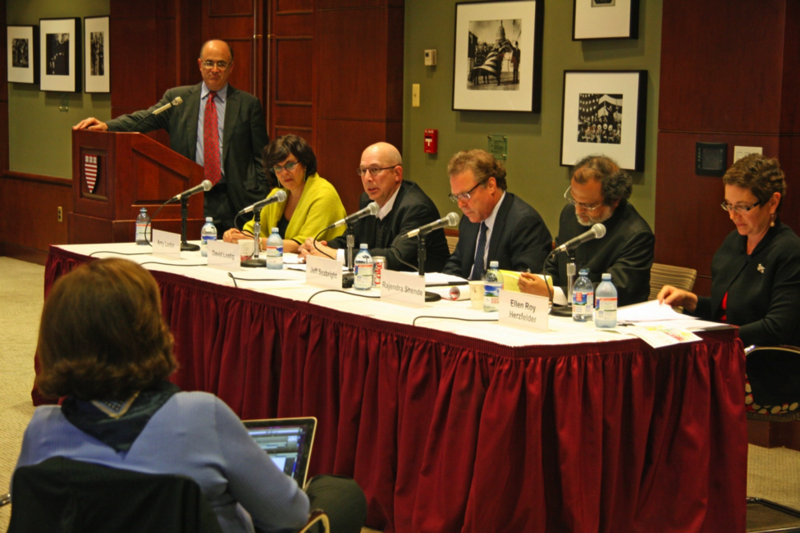 How effective are public-private partnerships in advancing the Sustainable Development Goals? How can we conceptualize and operationalize the effectiveness of partnerships? Through what mechanisms are partnerships’ effects likely to materialize? What are the attributes that contribute to the success or failure of partnerships? How have the structure and approach of partnerships changed over time?